bugrock wrote: how do I post a photo? If the photo is on your computer, you can use the upload attachment option below the text window which is visible when you reply to a comment. Today's pic, Blackrock Baths and deceiving photo angle because that highboard was HIGH. I went up once all full of bravado to dive off it and It's a hell of a lot different when you're up there looking down. No fkn way because I'd seen a bloke landing flat on his back in D/L Baths from a much much lower height and he was shipped out on a stretcher. I went to the lower one and Jumped instead. I was at one of those diving competitions. deceiving photo angle because that highboard was HIGH. Sorry, just realised he's diving from the lower one. Bellyflops oooooooooo, nasty sting, saw a lot of them aswell too Grammer, did a few myself in D/L learning, but the back one was serious, like hitting cement flat out, surface tension. We didn't realise these dangers at the time. Same as you Strum ! Went up to dive in from the top !! NO WAY Can you remember the name of the top diver that came over from England to compete in Blacrock ? I remember he always had a great tan !!! Lovely portal pictures recently. Recognised this when I logged in. Sinead wrote: Lovely portal pictures recently. Recognised this when I logged in. Thanks Sinead. So it is Seapoint then? 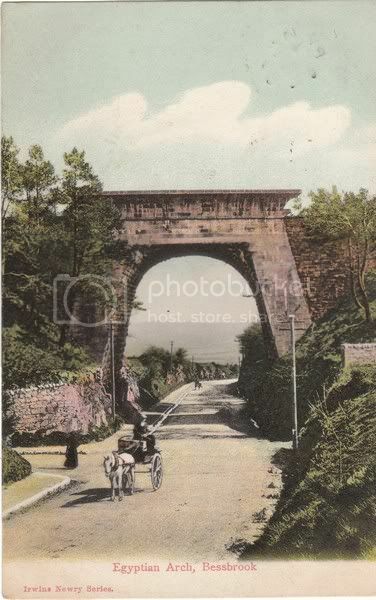 I can't remember where I found it but it mentioned Seapoint around the time of the railway construction, but this looks like a bridge that the train would have crossed rather than under? Had a chat with HID. That arch is known as the Egyptian Arch, it is in Newry on the main Dublin to Belfast railway line. Construction was completed in 1851 for the Dublin and Belfast Junction Railway Company and was the result of collaboration between engineer Sir John MacNeill and constructor William Dargan. Locally known as the Egyptian Arch, the rail bridge passes over the Newry–Camlough Road, in the County Armagh half of Newry. Aha nice one folks. I had my doubts about Seapoint. Amazing Bridge though. Thanks for that. Much higher than it looks in the other photo. A favourite spot for dissidents during the troubles for disrupting rail travel. Brilliant portal pic, Strum. A lot posher looking than I remember it though. Certainly not the Salthill I remember. The area below the hotel was known as "The Gut" and it was quite a significant area,there must have been a major landfill put in place after that photo. I'm sure Harjoe will put us right. I have no recollection of the baths or even ruins if it or the hotel. I posted that photo a few years back on the site, and if I remember rightly the only bit that is still there is on the left where we used to sit and watch the wind surfers from, I do remember the Hotel my mam worked there for a while, When did it close and when was it demolished anyone know ?? My mother also worked in the Hotel as did a number who ended up working in Boland's Biscuits. It seems that some of the future managers of the factory stayed in the Hotel and they offered some of the staff jobs in the factory. is the jetty in the foreground what was known to us as "The Ramparts"? As far as I remember The Ramparts were north of the railway bridge.